Naomi Moneypenny's thoughts on collaboration, future of work, machine learning, near term AI and behavioral change in individuals and organizations. Used well, I think a news service can be a great way to stimulate engagement on your network, and to solve some very basic use cases that people often ask for. Bear in mind, I said used well. Yammer can be very noisy for your new users and you certainly don’t want to exacerbate that impression, so use this capability judiciously and with lots of specificity on the audience you want to serve. The other thing you’ll want to consider is from whom do you want the posts to appear? If it’s your corporate blog, it may be fine that Casey from Internal Communications is automagically posting the latest blogs to relevant groups. But it might be annoying for Casey’s Yammer followers. Consider having a service account that provides the news wire. A service account is just a dummy user or a bot that your community managers or admins have access to, that you can hook up to use that account to post the wire into Yammer. Users can choose to follow it or the group for most control over their notifications. Now for your executives who tweet, you might want to work with them or their assistants, to have their accounts post the tweet into Yammer for extra authentic goodness. Executives who are out on social media tend to be ‘green dots’ in Yammer parlance – those who want to change how work is done and information is shared – and so they’ll likely enjoy knowing that their reach is extending inside the company too. And you can even help them set up a specific hashtag they use on a tweet to direct which group in your Yammer network the tweet gets posted to. That way, not everything that gets tweeted has to be posted. So cool! One last thing, to use IFTTT, you’ll need to have 3rd party apps enabled on your network. I know that will be a bummer for many, but the integration does need it to post to Yammer on your behalf. With those considerations aside, let’s begin! Head on over to IFTTT.com and sign up for an account there. Yup, its free, and they won’t spam you with anything at all. At IFTTT, you’ll find over 180 channels that you can source content from as well as post to. All the biggies are there from Facebook, Instagram, YouTube to the New York Times and you can not only post to Yammer, but more generally to email, text or even your Android watch. IFTTT lets you blend these sources into recipes with actions, hence the ‘if this, then that’ type condition. The possibilities are, well, at least 16000 ways if you only created one recipe with two channels. But recipes can nest (i.e. one recipe can kick off another) and you can add extra ingredients too. So there’s incredible flexibility. Twitter already has a channel in IFTTT, so the key here is to establish what tweets you’d like to be posted into your Yammer network. Yammer has a simple integration built in (using #yam on a tweet to publish into Yammer), but I really prefer IFTTT’s service for its reliability and control. You can specify hashtags on a tweet to control what group that tweet will publish into. Again, great way to really get the content you want. 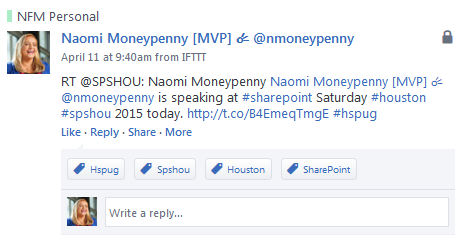 This has an additional benefit that the hashtags you use in the tweet will be live in Yammer too. For example #sharepoint in my tweet has meaning in the Twitterverse to explore, but the same is true in our company’s own Yammer network. If you use WordPress, Blogger or Tumblr and you have control or access to the blog account, all you’ll need is to do is to start creating a recipe. 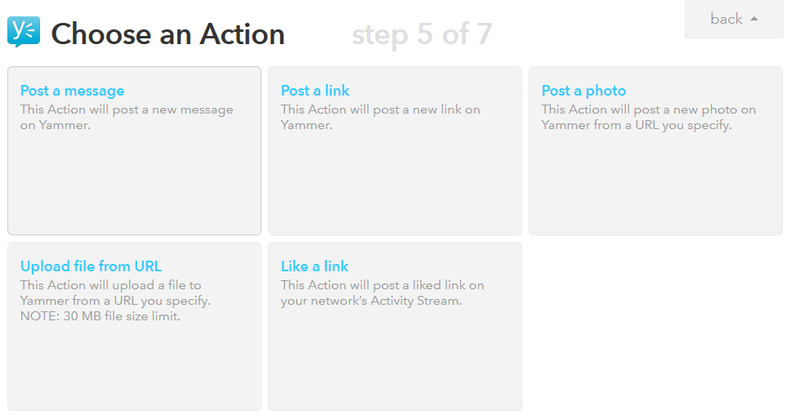 IFTTT will ask to connect to your Yammer account (that’s where the service account might come in handy). 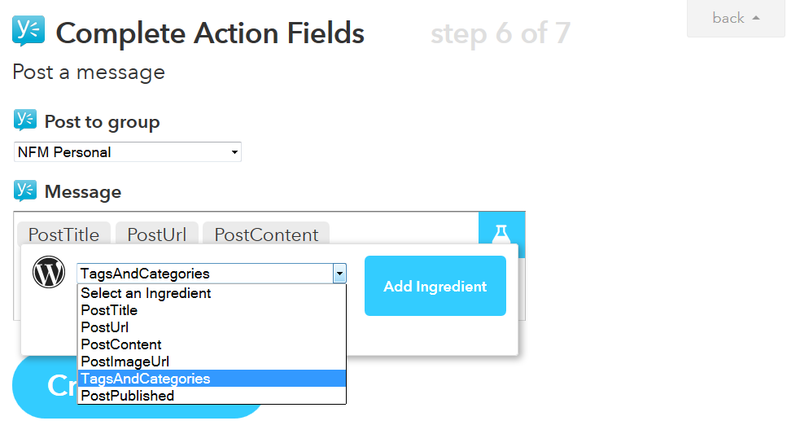 You’ll add a recipe that specifies when new content is added to the blog, then post a link (with content and image if you like) to a Yammer group. Never post to All Company. Ever. Please. Always post to a group, even if the content is relevant to the whole company. 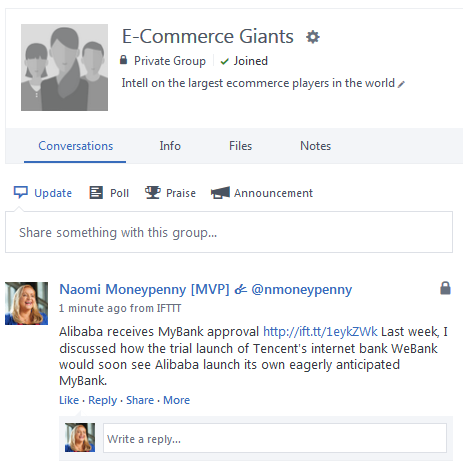 Have a news wire group if necessary, remember that all the content of your public groups on your Yammer network is available to everyone, regardless of whether they are a part of that group or not. 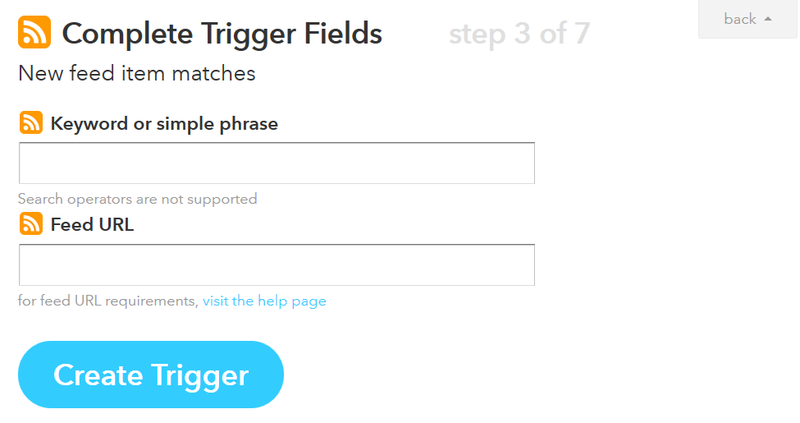 If you don’t have the ability to connect up directly to the blog source or if you are mining news about your company from the world at large, there’s an extra step before you use IFTTT since you’ll want to use an RSS feed. You can create an RSS feed by using a free service such as Google Feed Alerts. On an alert you can specify sources such as from news companies, stock/financial news, web results, blogs, videos, books, discussions or everything. You can even pinpoint a region that the news comes from. So take some time to think about what kind of news you want to post and play around with the alert settings to get a good result set. You also have the opportunity to set a couple of other filters from inside IFTTT too for even better accuracy. If you just want to post from a dedicated source, e.g. the company blog, that doesn’t have an RSS feed that generates automatically, you can try creating an RSS feed using a service such as http://feedburner.google.com. Or use a service to tailor specific/trusted sources such as Feedly.com which already exists as a channel in IFTTT.com. Another option is use IFTTT to create a feed that feeds another recipe. (We’re into Inception territory here, folks, stay with me!). We could get a general feed via RSS with news from anywhere (e.g. 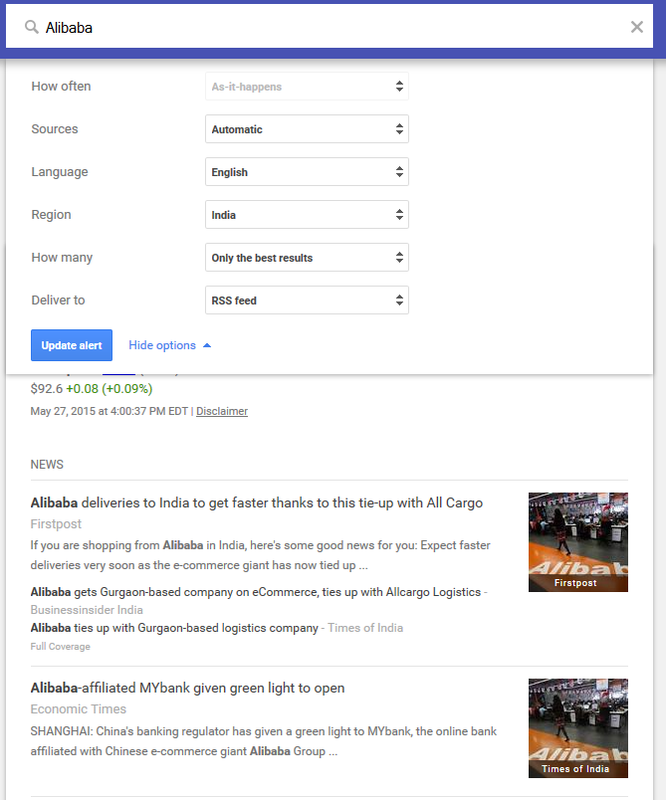 Alibaba news written in India), and then use a recipe in IFTTT to only look for a specific keyword/phrase in that news (e.g. AllCargo – a recent JV company). Then the results of that recipe (just Indian newspapers writing about a recent joint venture of Alibaba’s) could be used to fire another recipe that posts that news to Yammer. Got my feed – now what do I do? Once you have the feed defined, IFTTT itself is so simple to use. You specify the this and the that, and put some conditions on it if you want. What do you want the output to look like for example? Posting a message is simple, but there are other options too – links, photos, files and even likes! Do you just want the post title, publication date only, or add extra ingredients with the content or images? – Connect OneNote and Yammer together – you can automate posting of items into OneNote (such as collecting up favorite tweets or images) and then have that notebook post that it has been updated to Yammer. – Do you have personal interest groups on your Yammer network such as running or exercise goals that are part of a corporate wellness program? Your employees can have their FitBits and Nike+ statuses post directly into Yammer via IFTTT. Again, mindfulness of the noise potential, but this could be really useful for motivating a team and keeping up to date on progress. – Other collaboration/social technologies in your company? Are you using Dropbox, Chatter or Slack, you can have those systems also post into Yammer. – Monitor Internet of Things devices, HSE could get reports of connected devices such as thermostats directly into their Yammer group and even control devices such as lowering blinds at a certain temperature or turn a device on or off. – Carpooling groups or fleet management could use services such as Dash that connect the onboard computer in company vehicles to post updates into Yammer. Hope that this gave you some ideas to use in your own Yammer networks – as ever I’d love to hear how you’ll use this service. Thanks for writing this up. I’ve had a few different shots at this with IFTT and Zapier with the Yammer plug-in, but hadn’t thought of using Google Feed Alerts in the middle to help bind things together. Definitely agree that this sort of thing needs to be used with caused *not to* spam the all network feed. Also, it’s interesting to see OneNote being talked about in the same space as OneNote seems to be one of the newly loved tools in the Microsoft stack as I keep finding more and more people using it as part of their jobs. Microsoft have even plugged OneNote into their latest release of CRM Online which gives me more potential solutions to help drive the solutions forward. Thanks so much for your comment Scott. OneNote rocks – I love that product so much and it can do so many things! I really do need to do a series on it! And yes, I’m so happy it’s starting to get the love it deserves. OneNote really is the pioneer of a connected experience where it didn’t matter where the content came from and how you wanted it outputted – which now we are seeing with Sway and other tools that are seeking to break down the ‘artificial barriers’ between apps and just focus on the content. Entanglements in Culture, Innovation, Enterprise Social, Anticipatory Computing and Business Growth. Please follow this blog and I appreciate your comments. Yes! Yammer Will Work Together with Office 365 Groups! Business Intelligence: What’s the difference between Statistics, Metrics and Analytics?